Life Definitions: My Mother’s Surprise Party	Life Definitions: We’re Getting an Event Planner! 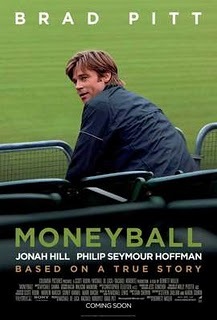 Brad Pitt did a wonderful job playing Billy Beane (or so I’ve heard, as I have no idea who Billy Beane is…) And Jonah Hill was fantastic as slightly off business student (yay!) Peter Brand, who has a different view on how to determine a person’s worth. Frankly, if you know anything about baseball, then you know the plot and the ending of this movie (the one truly sad thing about movies based on true stories…you always know the ending). That aside, the internal struggle to see these baseball players as more than pretty faces and to give them a chance. I was wary that it would become a dry commentary on the evils of money and how it skews the chances for entry into the World Series. Surprisingly, that didn’t happen. Pitt’s character does rage about it in the beginning, but the movie, as a whole, was about the Art of Baseball. What makes a person a great baseball player? The shots of Beane as a young man deciding whether to go to college or play pro-ball was great drama. This young man, who had everything going for him, was given the choice to be practical or going after the elusive dream. And when he took the chance, choked. This movies asks the audience, “What makes a person a great ball player,” and how do you know? Do you trust your gut or the numbers? Eventually, I think the answer we’re given is, you have to trust both. Baseball is a thin rope high up in the air, with everyone watching. You have to trust your gut, your instinct and the facts. There’s always more to a person.